Another VSTi based on chip created tune. This one created from famous Nintendo NES game "Battle City". Thats why the GUI is made based on the theme of this game. During the game these tanks has a two noise profiles. I recorded one, looped it and found that it has powerful bass and lead sound. Chaining such VSTi with different audio plugins possibilities are endless. During the Christmas holidays I made this sampler dedicated to Super Mario from NES console game. This sampler actually has 3 versions. The first one V1 was created as light edition consisting only parts from surface level (level 1-1, 1-3, etc), subsurface level (1-2, and similar) and dragon level (1-4, boss levels). All versions still misses water level theme (2-2). I hope to make them soon and put in all versions. It has almost all effects (getting coin, both jump sounds, etc). This version has the same parts divided only by 2 measures. It also have 2 octaves long bassy chip generated tones, almost all of them extracted directly from raw song. Only few tones which were not able to get manually are realtime created altering pitch from closest sample. Only for few - 3 or 4 raw samples the post-processing were made removing some chip (emulator) created noise which was annoying after sound normalization. While it has no real purpose for this sampler, its still fun and nostalgic to play around with it. I should make a exe version of it. Kinda bass VSTi sampler. Experimental work with Maize Sampler. Two layers where one of them responds half of velocity thus giving spectral differences respectively to velocity. Silent and distort snare sound in far background gives extra ambient feeling. 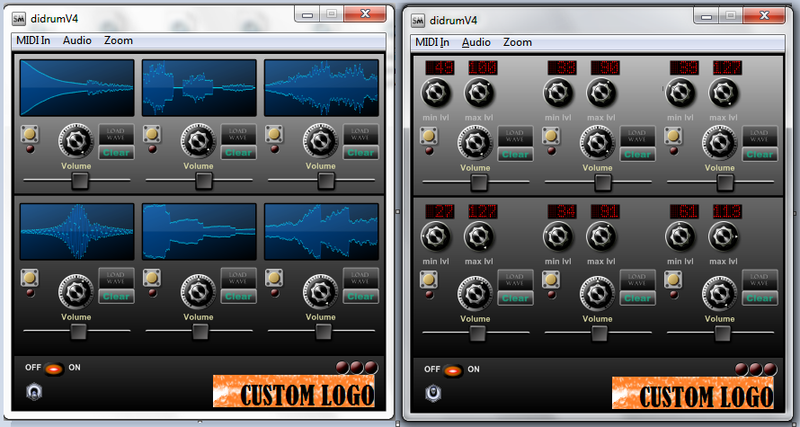 Its free to use and soon can be downloaded here as a VST for both - Windows and Mac users and as an AU. Small bash script with two loops iterating two arrays (pseudo 2D array). It helps to automatize standart interpolation with Grass GIS v.surf.rst default parameters and returns r.univar calculated raster maximum in appending text file which actually is comma seperated file and can be later for postprocessing. About a year ago one of my friends was tinkering with arduino and how to make a drummachine. The hardest part was to think about how to connect it with a computer or telephone. Well.. i still dont know about telephone, but connecting such external devices with computer needs an understanding about how the communication will be. As my friend was working with arduino, there is a small problem for him - in easiest and cheapest circuit arduino works only through serial communication. I started wondering around and found something similar to arduino called - Teensy. It has usb implemented in itself, even better - through ide it is possible to set the type of the device. In our case the device should be... super simple midi device. As I knew something about synthesizers (actually I dont but he thought so) and I was encouraging him to try to find a way make that arduino speak "in MIDI", knowing that such thing will allow connect it with any sampler or specifically build synthesizer for it. As I was tinkering before with Outsim Synthmaker, I offered to build a software demo version of such a sampler (download here exe and dll version). I never worked with samples in Synthmaker before, so this task was kind a challenge for me. After he defined what he wanted, I made little 6 sample midi sampler starting with C3 key. It has implemented release - so it will sound 30% after after releasing a key. It can load samples and it shows loaded samples in GUI. It has 3 classes of loudness which are adjustable with two knobs for each sample. 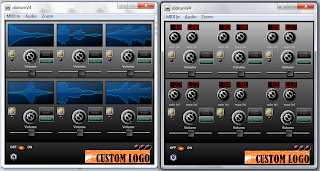 Each sample is testable directly in GUI and for each there is main volume and pan option. 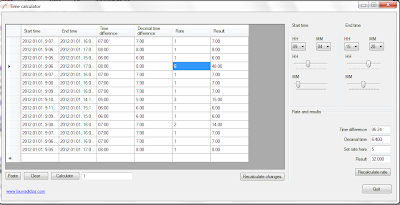 This is another small tool (download here) which can be used in accounting calculating time difference in hours and minutes to decimal hours, giving a rate for such a difference and finally obtaining the product of rate and decimal time difference; the result can describe daily wage. Additionally I made a table which is actually is Visual Basic 2010 gridDataView object, invented direct paste (by right mouse button or just press a button) for bulk time-data import, which could be copied from spreadsheet documents, and a possibility to copy out multiple selected cells. 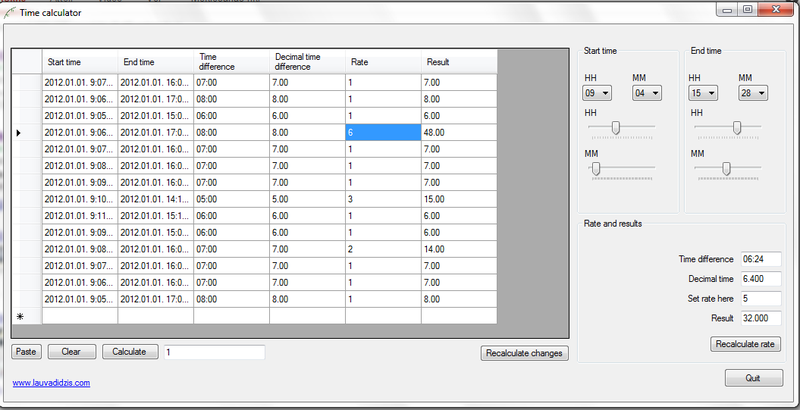 Rate can be set directly in table, then there is only need for recalculation for changes. Otherwise, it is possible to fill the table manually. The short story behind creating this software.